When the Internet first started to become popular and then hit the mainstream, Google in their infinite wisdom envisioned a need. There were millions of pieces of data information which were scattered and floating around on the Web, so they thought, why not organize it by relevancy, so people can find it easier. Google as a result has become the worlds most powerful search engine, so there’s no reason why you shouldn’t take full advantage of it. The search-engine industry itself has been filtered down to three major players, where in the earlier days of the Web, there were search sites if you recall, such as Hotbot, Mamma, Dogpile, Alta Vista etc. Google in particular has wiped out the prominence of the majority of these secondary search engines, and they are now as great as ever. Today, when you think of Searching on the Internet, you automatically think of Google first. But they’re not just resting on their success, as they are constantly and actively focusing on new and unique services. Google has spent the past few years to test as well as tweak and fine tune new features, just to bring you a better Internet experience. The result is it helps you search and find what you need a lot quicker and more efficiently. So now, you can impress your loved ones as well as attract new friends by learning new and improved Google tricks by knowing some of the services that they offer. So you’ve been to some sites on the Internet which provides their own “Search” box, but it doesn’t produce any results since the function is just poor. We’ve all used one at one time or another. Their defective “Search” doesn’t really matter however as Google can do the search on that site for you. All you need to do is add “site:_____” into your Google search. 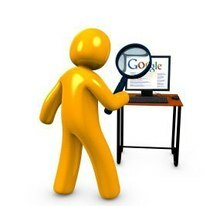 Using Google Product Search may just be the quickest way to finding a specific product which you’re wanting to purchase. You can also do a search on specific sites such as eBay or Amazon by using the “site:_____” function. This relatively new site is designed to replace “Google Shopping” and “Froogle.” You can access this by using Google.com’s Web search page and then select the “Shopping” link. So if you’re wanting to know what time it is, then just type in “time” in Google’s Web Search page and Google Instant will immediately tell you the time in your local area. Type in “time in New York” or whatever city that you’re interested in, and it’ll tell you the exact time for New York, regardless of where you are on the planet. This feature comes in handy when you need to know how many time zones someone or some city is in. The same goes for the temperature or the weather outside your own city or anywhere else in the world. Just type in “weather” in Google’s web search box and you will get a 4 day forecast for your immediate local area. Entering “Weather in (Whatever City)” will reveal the expected precipitation anywhere that Google has a forecast for. You can also quickly click from Celsius to Fahrenheit or vice versa. Is your handy calculus missing? Get any simple or even complex calculations that you need, by using Google’s Web search box. Type in something easy like “12 x 7,” and Google will instantly get the answer for you. If you need something a little more complex, yes, Google can calculate that for you as well. Google’s calculator is also able to distinguish and then tell the difference between something like 6*5-3 (27) or 6*(5-3) (12). It’s also possible to use either an “*” or a “x” for it to multiply. Google.com can also instantly convert measurements as well. If you enter into Google’s Web Search Box “5 meters in yards” and you’ll instantly get “5 meters = 5.46806649 yards.” You’re also able to convert distance, volume, area, energy, currency, information as in (bits and bytes), etc. When you enter Commands such as “Site:” it can come in extremely handy. But nothing is better than knowing which of the search “operators” you can put in the front of your search words, in Google’s Search Box to be able to narrow down or expand your searches. • Asterisk (*) if you’re unsure how to end a certain phrase, then place an asterisk as a wild card. Google will then automatically fill in the blanks. You can find a full list of their search operators on GoogleGuide. If you’re expecting a delivery from either Fedex, UPS, or the U.S. Postal Service, you can directly enter the tracking number of the package into the Google’s Web Search Box, and bam, it will give you your package’s shipping data. If you’re only wanting to search for a certain type of file extension on the Internet, then you can then just search for that particular file type by using “filetype:”. The file extensions are typically the same ones used in Windows. This list includes: Word (.doc( files, Adobe Acrobat (.pdf) files, text (.txt or .rtf) files, Excel (.xls) files, PowerPoint (.ppt) files etc. If you don’t specify a file extension type, Google will include all of the file extension types in the search results, beginning with .html. The “file extensions” will not be on the top of the search results however. If you’re wanting to search for multiple file types, you can then separate them in the search box by using the “OR” search operator, ex: (“free gardening ebooks filetype:DOC OR filetype:PDF”). This will give you all the .pdf and .doc files indexed for free gardening ebooks. If you’re wanting to do a Google Image search, you can then narrow the search down by going to the left of the screen and specifying a search for photographs, clip-art or a line drawing. Using the “define:” operator in Google’s Web Search Box goes far beyond just definitions from a dictionary. Yes, you’ll be able to get the definition of the word you enter, but you can also search for phrases, acronyms, tech based terms, and even urban slang words. The results will come from a variety of sources such as, WordNet, Wiktionary, Wikipedia or just about any other source which has definitions or encyclopedic knowledge.